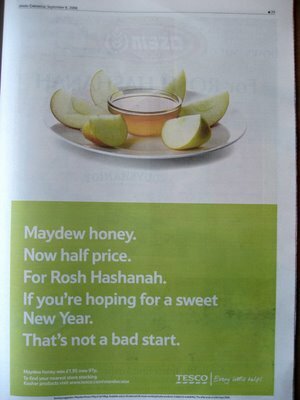 Noticed this full-page advert in the Jewish Chronicle this morning and was impressed by Tesco’s clever niche targeting. How to engage more with your customer? Understand what’s going on in their lives. Simple, clever and personal advertising like this is surely the future for growing brand loyalty. Tesco, the UK’s leading food retailer, is taking its clothing offerings upscale. The company has launched a higher-end, 30-piece apparel collection for women and men, which includes pieces such as extra-fine merino wool knits and silk printed tea dresses, with prices ranging from 8 pounds for a jersey tank to 90 pounds for a leather biker jacket.